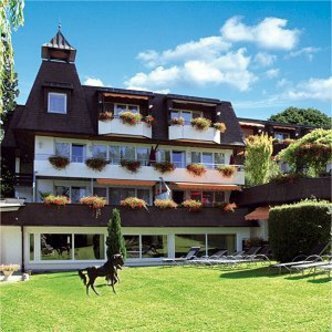 The real charm of the 4star superior TOP CountryLine Hotel Ritter, which is situated close to the spa gardens and the health centre, lies in its individual architecture and enchanting location. From our garden terrace you can enjoy a unique view over to Roemerberg with its castle ruins as far as the Vosges Mountains. 75 beautiful rooms mostly with balcony or terrace offer modern comfort and are equipped with bath or shower, WC, direct dial telephone, mini bar, SAT-TV, Safe and WIFI. A lovingly decorated interior combines with the cosiness of timber beaming and the light of the chandeliers to create a festive, refined atmosphere. This provides the perfect setting for our gastronomic services. Here you can enjoy regional and international specialities, a lavish breakfast buffet and much more. For our business guests we provide 1 conference- and banquet rooms up to 80 persons with a wide range of technology equipment. In the health spa centre your body and mind will feel completely rested after using the mineral bath or after a wellness treatment individually organized for you. For all guests arriving by car our parking lot in front of hotel is at your disposal. Simply feel at home. **ATTENTION** Limited Front Desk Hours from 7:30 a.m. until 10:30 p.m.